I was sent this book by the publisher as an unsolicited review copy, so I didn't feel much obligation to read it. But I read the synopsis, and it sounded pretty interesting to me, despite the fact that it's contemporary (and I don't really like contemporary novels). I liked this novel, even if I didn't love it. The story is told from the first person point-of-view of Consuelo - "Lo". She is experiencing symptoms of MS, which is in her family. Kit, her ex-boyfriend, is grieving the loss of his dead girlfriend, Lucita. Thomas, a friend of Kit, is a former child soldier from Liberia, who has PTSD (or worse). Ellen, a former friend of Lo, has been using more and more drugs to feel less and less. Kaya, a former friend of Lo, has a condition that doesn't allow her to feel physical pain. 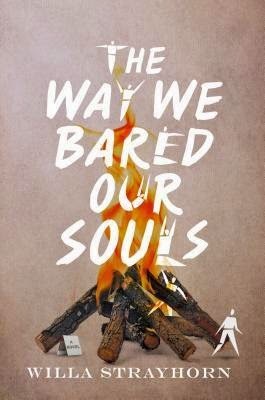 All five teenagers suffer, and when Lo gets this group together, and they undergo a Native American ritual. But the ritual allows them to swap burdens, and for a week, they must learn how to handle new burdens, as well as their old ones. This book was heavy. The story was so dense. And I don't mean physically. The novel isn't all that long, but the content is very dense. It took me a while to get though the book, and not because I was bored or because it was dragging. There was a lot going on, both on the surface level, and subtly. The author did a really great job of building all the levels of the story. There are five main characters in this book. Lo is the narrator - we get her first person perspective throughout the entire novel. In the beginning, Lo pretends that things aren't the way they are, that she doesn't have MS. When she meets Jay by chance, she doesn't necessarily believe that the ritual will cure her, but she wants to believe that SOMETHING will change. She gathers four ailing peers as well - not really friends, but acquaintances. The swap takes everyone by surprise. Lo has Kaya's condition. Kaya has Thomas's condition - except she sees memories of her ancestors (who were Native American). Thomas has Kit's condition - so he's afraid of death (Kit's girlfriend died of a car crash). Kit has Ellen's condition - he isn't addicted to drugs, but he is always high. Ellen has Lo's condition - she has symptoms of MS. Lo actually likes Kaya's condition, not having pain. Ellen hates her new condition. Kit is always happy (high), so he doesn't really seem to mind. Thomas is haunted. reserved, and now seems afraid of things (whereas he was not afraid of much better). Kaya has visions of her ancestors, which involves a lot of death and fighting with whites. Overall, the week passes... interestingly. They have a week because Jay (who performed the ritual) told them that they should come back in a week. The teens learn a lot about themselves, and each other (that sounds cliche, but it's true). None of them were friends at the start of the book. But as the novel progressed, they banded together. And in the end, the teens look out for each other. Lo has always been intrigued by Thomas, the Liberian boy who used to be a child soldier. Throughout the course of the story, this romance develops. It's such a raw and deep relationship from the start. Lo doesn't want to believe that she has MS, but knows better. Thomas is haunted by death, caused his own hands, and otherwise. But slowly, they learn to trust each other differently. The ending of this novel took me by surprise. There was no way that I could have seen it coming - no obvious clues, other than the constant reminder of Lo's father's job. But one character surprised me, and made the ending very explosive. Overall, I was content with the ending, if not a little sad. But happy. Theoretically, this one should have gotten more stars, but I didn't *love* the book. I thought it was interesting, I followed the story, and I definitely wanted to know what was going on and what would happen, but I wasn't entirely invested in the book. These types of books aren't really for me, honestly. I gave this one a chance (and I'm glad I did! ), but I'm not a huge fan of tough-issue contemporary novels. There are a lot of teen problems handled in this book, and the author handled the difficult content well. I just don't really like reading such sad novels. Personal preference! I think I wanted a little more from the plot with Kit and Ellen, and less with Kit and Kaya. It seemed like there was a love triangle going on (not a significant one), but the wishy-washy behavior of Kit could have been contributed to his state of high happiness. I also wanted a little more from Kit's backstory. I feel like everyone got some sort of personal healing, during that week. But Kit's healing didn't really seem personal - I guess him being high the whole time allowed him get over his ex-girlfriend's death? But wouldn't he have experienced some sort of withdrawal, after the teens performed the ritual again? Wouldn't he have gone way down after being so high (so to speak)? I was a little confused as to his personal healing, as well as physical healing. But anyway. I didn't love this book, I didn't hate it, but I wouldn't rate it five or four stars. I was deeply impressed by the debut, but as far as fiction and reading for enjoyment goes, I only liked the book, on a 3-star level. Which isn't bad! Hmm, well, these types of novels don't really appeal to me - I struggle with tough-issue contemporary novels, but I liked this one. It's not something you can just jump into and read - it's not a light and fluffy read. It's dense and gritty and deep, and I liked it well enough, but I didn't love it. So, take that as you may! 3 stars. A good debut novel from Strayhorn! I have no doubt that this talented author will write many more thought-provoking and intriguing stories. Thanks! I thought the cover was intriguing too! Sounds like this is a fantastic book and one very worthy debut, but I'm not sure if a book so gritty and full of different issues is exactly what I need right now, BUT I plan to keep it in mind for maybe later in the year! That was kind of my issue! I'm not one for these types of contemporary. Thank you, Pili! Sounds like one 'worth' reading. I like books that make me think, as well as the ones that provide that great escape :-) Thanks for sharing!! This book was actually one of my top debut books of 2015, and believe it or not, your review makes me want to read it even more! I don't usually read contemporary, but this seems to have a bit of the supernatural to it as well. Plus I don't mind stories with a heavy subject matter. Ehh, probably not for your tastes, honestly. But it was interesting, like you said. You're very welcome - and thank you!